Langtang region was one of the first destinations in Nepal that was explored by initial international and national trekkers in the country. This is a very beautiful destination to venture not only when you are in time crunch but also when you have time in Abundance. Langtang region is the quickest gateway to the high himalayas from the capital city of Nepal. Alike every other alpine region and trekking trail, Langtang region as well is protected by the Langtang National park. This national park was the 4th national park of the country and the first ever Himalayan national park. The national park comprises of 3 districts namely Nuwakot, Rasuwa and Sindhupalchok and covers an area of 1,710 kilometer square. Langtang is home to one and only indigenous community and they are known as the Tamangs. Tamang people were known as the horsemen in the age old days and believed to have migrated from the autonomous region of Tibet. In the modern days, these people are known as one of the most hospitable and religious people in Nepal. Furthermore, they are well famed for their architectural and weaving skills. Their houses, clothes, decorative are a display of their skills in art and crafts. These handful of indigenous communities share the protected land with some rare species of plants and animals. The high and low land of Langtang conservation area makes space for Rhododendron of several hue, tall pine trees and strikingly green bamboo forests. On top, this region is as well known as the destination for the best wildflower blossoms in the country. Since langtang is an off the beaten trail and these forests and terrain is mostly left by itself, it is a perfect home of red pandas, snow leopards, wild cats and many rare habitats. In terms of trekking route and mountains, Langtang region does not fall back from any other trekking trails in Nepal. Tucked in between Everest and the Manaslu regions, Langtang as well has few 7000 meter mountains that set the centerstage of the trek. 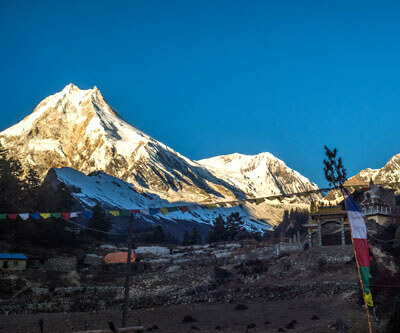 Some famous mountains include, Dorje Lakpa range, Langtang Lirung, Shisha Pangma and Jugal Himal. These mountains are best seen from the vantage points of the treks Gosainkunda, Langtang region, Ama Yangri, Tamang heritage and Ganja La. 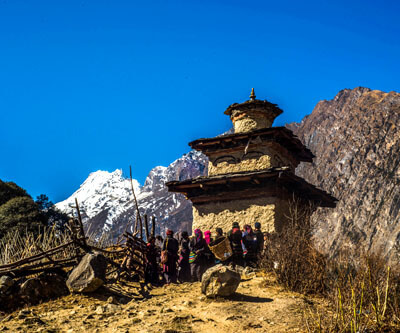 Langtang region along with Manaslu was one of the hardly hit destinations by the 2015 earthquakes. The houses along the trails were dismantled as the house of cards or like the children’s building blocks. However, immediately after the quake and as soon as 3 months people started building back their homes. As tourism was the only source of income after agriculture, people now have almost built back the lodges and have started serving the trekkers in the region. The trails had been thoroughly surveyed by national and international bodies and have provided with reports of Langtang being safe for trekking. For treks and tours in Langtang region please click here!